The influence of Pavlovian conditioned stimuli on ongoing behavior may contribute to explaining how alcohol cues stimulate drug seeking and intake. Using a Pavlovian-instrumental transfer task, we investigated the effects of alcohol-related cues on approach behavior (i.e., instrumental response behavior) and its neural correlates, and related both to the relapse after detoxification in alcohol-dependent patients. Thirty-one recently detoxified alcohol-dependent patients and 24 healthy controls underwent instrumental training, where approach or non-approach towards initially neutral stimuli was reinforced by monetary incentives. Approach behavior was tested during extinction with either alcohol-related or neutral stimuli (as Pavlovian cues) presented in the background during functional magnetic resonance imaging (fMRI). Patients were subsequently followed up for 6 months. We observed that alcohol-related background stimuli inhibited the approach behavior in detoxified alcohol-dependent patients (t = − 3.86, p < .001), but not in healthy controls (t = − 0.92, p = .36). This behavioral inhibition was associated with neural activation in the nucleus accumbens (NAcc) (t(30) = 2.06, p < .05). Interestingly, both the effects were only present in subsequent abstainers, but not relapsers and in those with mild but not severe dependence. Our data show that alcohol-related cues can acquire inhibitory behavioral features typical of aversive stimuli despite being accompanied by a stronger NAcc activation, suggesting salience attribution. The fact that these findings are restricted to abstinence and milder illness suggests that they may be potential resilience factors. Clinical trial: LeAD study, http://www.lead-studie.de, NCT01679145. Daniel J. Schad, Maria Garbusow, Florian Schlagenhauf, Quentin J. M. Huys, Andreas Heinz and Michael A. Rapp contributed equally. The online version of this article ( https://doi.org/10.1007/s00406-017-0860-4) contains supplementary material, which is available to authorized users. This work was supported by the German Research Foundation (Deutsche Forschungsgemeinschaft, DFG, FOR 1617: Grants HE 2597/13-1 and 13-2, HE 2597/14-1 and 14-2, HE 2597/15-1 and 15-2, RA 1047/2-1 and 2-2, SCHA 1971/1-2, SCHL 1969/2-1 and 2-2, SM 80/7-1 and 7-2, WI 709/10-1 and 10-2, and ZI 1119/3-1 and 3-2). Eva Friedel is a participant in the BIH Charité Clinician Scientist Program funded by the Charité-Universitätsmedizin and the Berlin Institute of Health. Moreover, we thank the LeAD study teams in Berlin and Dresden for all the work and help regarding data collection! We would also like to gratefully thank Carolin Wackerhagen for producing the alcohol- and water-related background stimuli! Finally, we are grateful to Lee Hogarth for discussing the nature of our PIT effects, and for interference account predictions. 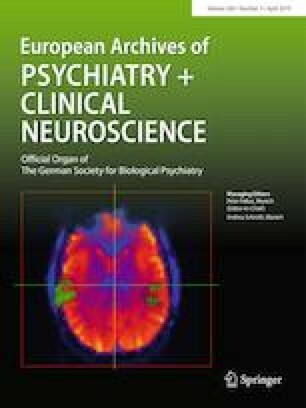 MR-imaging for this study was performed at the Berlin Center for Advanced Neuroimaging (BCAN) and Department of Psychiatry and Neuroimaging Center, Technische Universität Dresden. AB, AH, MAR, MNS, QJMH, USZ were responsible for the study concept and design. CS, DJS, HW, MG, MS, NB, PS and QJMH implemented and piloted the PIT (behavioral and fMRI) paradigm. AH, CH, CS, EF, MG, MS, UE, and USZ recruited alcohol-dependent patients and assessed the follow-up data. HUW and SKP were responsible for the assessment of questionnaires. SN set up a preprocessing pipeline for the imaging data. DJS, EF, FS and MG performed the first- and second-level analyses on fMRI data. DJS and MG performed further statistical analyses with support of AH, MAR and QJMH. AH, DJS, EF, FS, MG and MS drafted the manuscript. CS, HUW, HW, MAR, MNS, NB, PS, QJMH, SKP, SL, SN and USZ provided critical revision of the manuscript for important intellectual content. All the authors critically reviewed content and approved the final version for publication.